The Warriors improved as the game wore on and showed a ton of heart in game three in Vernon. Unfortunately for the Tribe, the Vipers had an awesome start and held on for a 6-4 victory and a 2-1 series lead. It really was a disastrous start for the Warriors. Matt Anholt won the opening faceoff but Mac Ferner fumbled the puck at his blue line. The play drifted into the Warriors zone, the Vipers won a battle, and Brett Mulcahy converted the ensuing scramble for a 1-0 lead just 22 seconds into the game. The first playoff action in Vernon in three years and the game had swung before most guys had taken a shift. Vernon got a second when Demico Hannoun buried a Josh Bryan rebound nine minutes in. 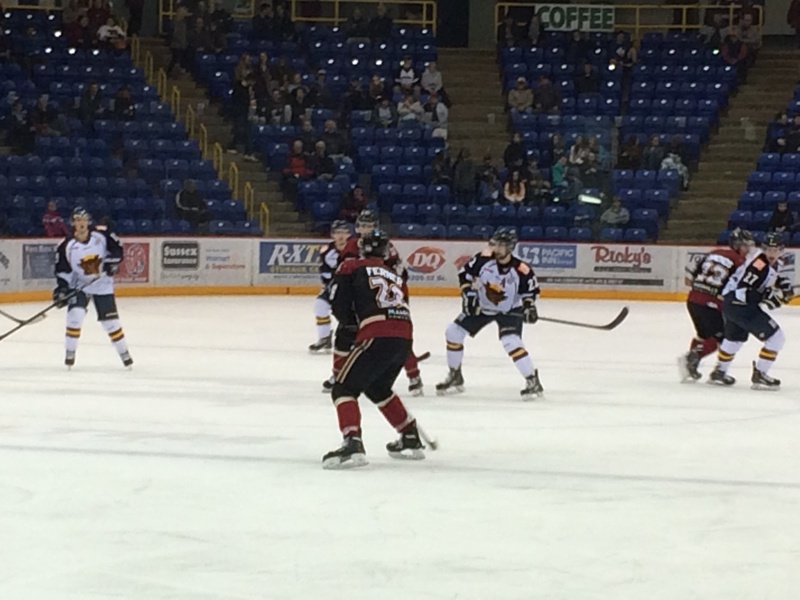 The Vipers also did a great job of containing West Kelowna early on, and led 2-0 after the first. The hosts kept the pressure on for the first part of the second period and put the game seemingly out of reach. TJ Dumonceaux pounced on a big rebound to make it 3-0 Vernon three minutes in, and Brett Mulcahy made it 4-0 a couple of minutes later after Brendan Persley had cranked the bar. The Vipers were the better team for the first 35 minutes or so, however the Warriors really turned things around late in the second and forced the issue throughout the third. A determined finish from Reid Simmonds got West K. on the board late in the second. The pressure really began to mount early in the third and suddenly the Warriors were all over it. The puck spent a ton of time in the Vernon end in the final period, and while the Vipers did a good job of keeping much of the pressure to the outside, Austin Smith was also forced to make some really good saves (his glove stop on David Pope with five minutes left was a total gem). Carl Hesler jammed one in just 90 seconds into the third though, and collars in Vernon began to tighten. Vernon desperately hung on to the nervous lead for most of the period. Andy Desautels, for his part, made the stops he needed to, including a savvy save on a Michael McNicholas penalty shot. With four minutes left, Liam Blackburn potted his first of the playoffs to make it a one-goal game. Momentum was swinging hugely in West Kelowna’s direction, but the comeback train was derailed when Mulcahy ripped home a professional finish on a Vipers 2-on-1 just 13 seconds later. Refusing to go quietly, the Warriors got back on the front foot and earned another greasy goal – on Blackburn’s second of the night after an aggressive Ryan Fraser-Lee pinch led to a Persley slashing minor. The Warriors were within one again and had some hope (if not much energy) left for one last gasp. Unfortunately for the visitors, Brett Mulcahy found the empty-net for his fourth of the game to seal Vernon’s victory. Nice deadline acquisition, Vipers. Nice win too. Overall, it was another epic hockey game between these rivals, and arguably a more focussed game all around. It was still bruising, playoff-type hockey, but this time without any nasty injuries or hugely controversial plays or calls. The Vipers were the better team in the first half of the game, and took a big series lead as a result. The Warriors, however, can feel very positive about doing a lot of things well on the road (despite all the key injuries). And after a showing like that, even if it did end in a loss, there can be no question that this series is far from over. ***I spoke to Andy Desautels BEFORE the game and ran this windy interview in the first intermission of the broadcast, if you’re curious. I also had this conversation with Brett Mulcahy for the second intermission. Afterwards, I spoke with Liam Blackburn and ‘AP’ Michael Winnitoy. Listen to Blackburn at this link and Winnitoy right here. I feel like I just watched two gangs brawling for the frozen streets. The Vipers upped their game and stole a huge road win in game two. They carried momentum for much of the night and now have a ton of it heading back to Vernon. Game on. Series on. Bring a helmet and a lawyer to game three. After getting run around by a potent Warriors powerplay in game one, Vernon played a somewhat more disciplined game in game two. More to the point, the Vipers just improved overall, showing a fierce forecheck all night and even beating the Warriors at the transition game. The Snakes played better in all three zones and also got some luck along the way. The Warriors, meanwhile, didn’t play badly, and certainly could be considered unlucky. But timely goals didn’t materialize, and West Kelowna ended up losing much more than the series lead. It seemed like West Kelowna’s powerplay would come through again when Carl Hesler wacked in a loose puck seven minutes into the game. However, Hesler was called for slashing on the play, negating the goal and early momentum for the hosts. Shots and scoring chances were probably quite even in the second, but Brett Mulcahy gave the Vipers a lead when he flicked one into the very corner of Andy Desautels’ net with five minutes left in the first. Mulcahy converted a scramble for would hold up as the winner early in the second, after one of the game’s more controversial decisions – a roughing call to Ryan Fraser-Lee. And talk about surviving (or not) the swings of playoff hockey, with Brenden Persley beating Desautels on a partial breakaway after blocking a Ben Tegtmeyer shot just 30 seconds after Mulcahy’s PPG. The Mulcahy/Persley/Sparrow line really was good for the Snakes in this one. Matt Anholt gave the Warriors some life when he dug a rebound past Austin Smith a few minutes later, but you could feel the life go out of the building when Adam Plant needed to be helped off after a (clean) Colton Sparrow hit soon after. Vernon had a good road game overall and an especially strong second period, but the Vipes also did a good job of locking things down in the third. But if the Adam Plant injury didn’t sting enough, the Warriors were dealt another massive blow when Dallas Calvin caught Seb Lloyd with a knee-on-knee hit with three minutes remaining. Lloyd also needed to be helped off, leaving a depleted bench with a major powerplay but no palpable shot at a comeback. Finally, with Desautels on the bench for a final 6-on-4 push, Brett Mulcahy found the empty-net for a short-handed goal, his hat-trick, and the final nail in West Kelowna’s coffin. The action didn’t stop there of course, with Nathan Craft colliding with Austin Smith in the final minute and Mike Statchuk dropping the gloves in defence of his goaltender. The last 20 seconds was heated. Oh yeah, and things boiled over in the crowd too. No one wants to see that, John Hebert. So battle #2 of this first round war goes to Vernon, and the devastation doesn’t stop there. I don’t have anything in the way of updates yet, but anyone who watched Adam Plant or Seb Lloyd helped off the ice knows it doesn’t look good for either Harvard commit. That’s West Kelowna’s top scorer and top defenceman lost in a matter of an hour, with Ryan Ivey, Taki Pantziris, Jordan Masters, and Jason Cotton already on the sidelines. 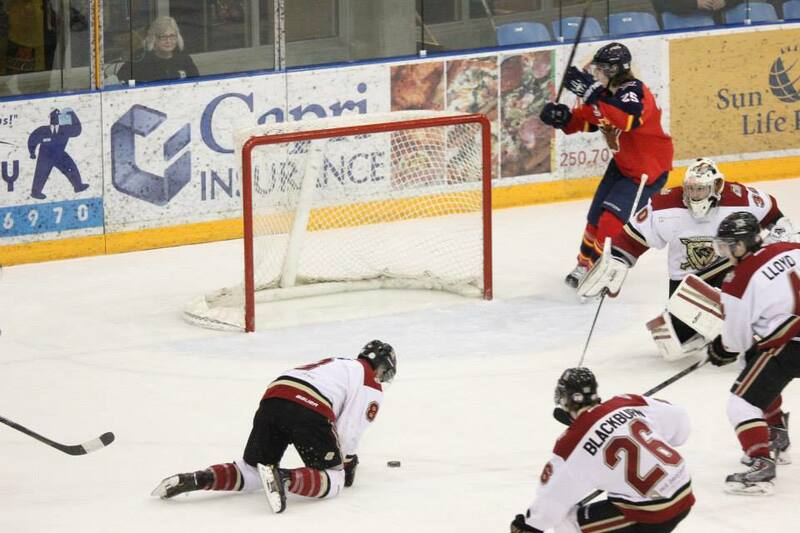 An entire line that was tearing the BCHL apart and the club’s top three blueliners. Ouch. By the end of this series there are going to be 14 injuries and 9 suspensions, and the clubs will be playing neutral-site games behind Swiss Guards to prevent rioting in the stands. Man I love the playoffs. 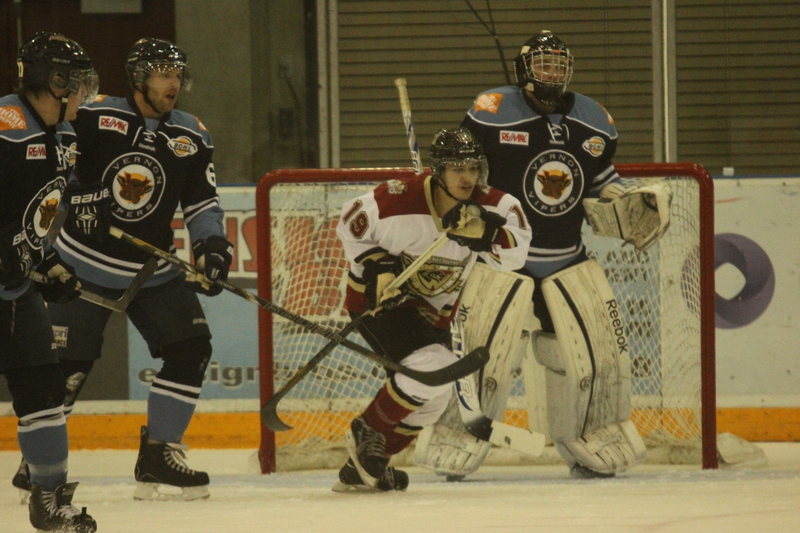 West Kelowna got a fantastic start to the playoffs with a 5-1 triumph over Vernon on Tuesday. A scorching powerplay. Strong team D. Wonderful puck control. The Warriors really did put their best foot forward. Carl Hesler opened the scoring when he fired a sharp-angle bid that looked like it bounced off Austin Smith’s skate and in about eight minutes into the game. Hesler was the screen when Adam Plant blasted one home late in the second, and a beautiful feed from Matt Anholt to Seb Lloyd gave the Warriors a 3-0 lead after 20. TJ Dumonceaux buried a Ken Citron rebound early in the third, ruining Andy Desautels’ shutout bid and giving Vernon a legit shot at a battling back into the game. However, the Warriors soon put the contest out of reach when Adam Plant ripped home his second powerplay goal of the game. The punctuation came from Seb Lloyd, when he banged-in his second after Matt Anholt had drilled the post. West Kelowna had some lovely offensive execution in this game, but there were other aspects too, like strong faceoff numbers, crisp passing, good discipline (even in the face of belligerence), lots of shot-blocking, and good goaltending. Of course, the main story of the game was success (or maybe even outright terrorism) on the powerplay. But it would be neglectful not to mention a very strong defensive showing from the Tribe. Vernon had just 28 shots in the game, one goal, and barely any scoring chances. Rylan Ferster talked about getting the goals against down after allowing 7 in the final 2 games to Trail, and I would imagine this is what they were looking for. The Vipers have some skilled guys, and they’ll make some noise in this series. They were kept pretty quiet in the opener, though. For the Vipers, a key to this series is to play that physical style of theirs without crossing the line. We all knew that coming in. In game one, however, they crossed that line and it cost them. The five penalties the Warriors scored on? Two hits from behind, a slash 200 feet from their own goalie, a high-stick, and a hit-to-the-head. I betcha Austin Smith was cursing his teammates under his mask. Say what you will about being tough to play against, the Vipers know they’ll need to behave themselves or this could be a quick series. It did border on the dangerous too, and I wouldn’t be surprised to see supplemental discipline arising from game one. Povelofskie got a major for smacking into Desautels in the dying seconds, and it was a pretty cynical play at that point of the game. Ryan Renz also had an elbow on Kylar Hope that was missed on the ice but looked atomic on the video (3:35 mark of the highlights). Now, if the Vipers penalty kill had stood tall, the game could have taken on a much different complexion. This certainly wasn’t a blowout. A hot powerplay was the story, and you need a little luck for that to happen. 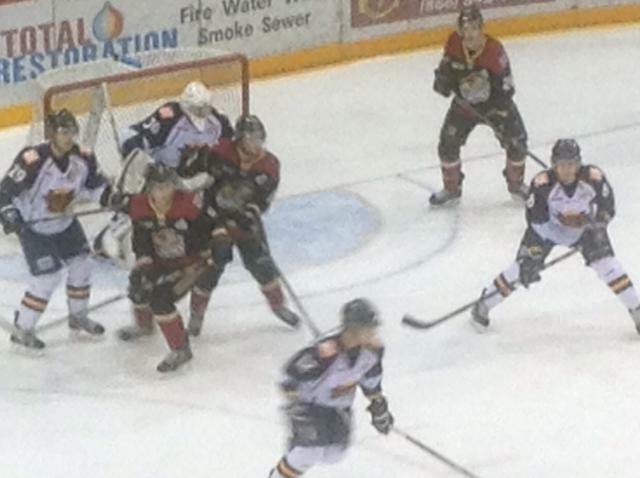 In fact, the Vipers were up 1-0 in five-on-five play. But I would say that the puck spent way more time in the Vernon end than in the West K. end. Andy Desautels made a few timely saves, but really wasn’t tested nearly as much as Smith. Overall though, it was another fun game to watch between these rivals. There was good action, a frantic pace, and some big-time hits. Just 700 odd fans though. Really West Kelowna? You are missing a heck of a show. ***Jason Cotton limped off the ice after a second period collision with Ryan Renz and didn’t return. Nothing dirty about the hit at all, but it appears to have aggravated Cotton’s existing leg injury. I don’t know much yet, but I’d be surprised to see him out there for game two. Just 72 hours after dispatching the Smoke Eaters to wrap up the regular season, the Warriors open the 2014 playoffs against a vaunted rival. The quest for the RBC Cup is now underway! The 2013-14 regular season was an outstanding campaign for the Warriors – one of the best this organization has had (In 07/08 Westside went 40-20 and finished second to … Penticton). And there are some things for this club to be very proud of and build on heading into the post-season. 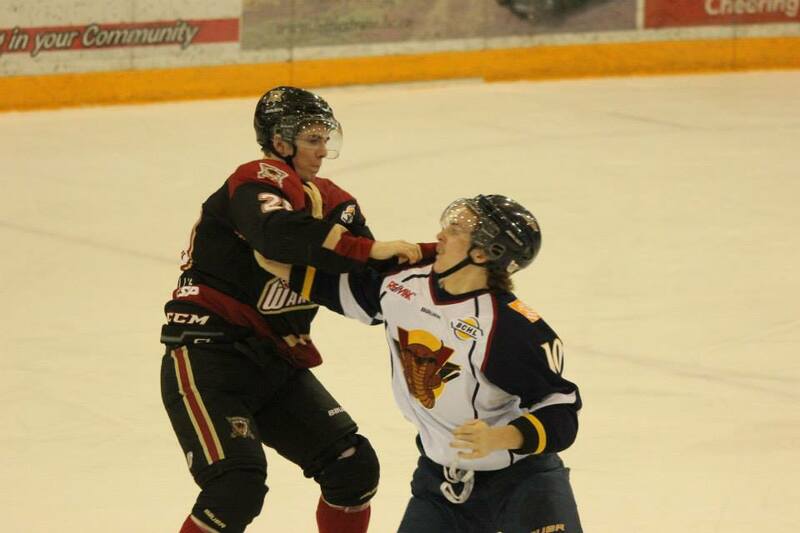 * Road Warriors – West Kelowna earned the best road record in the BCHL this year at 18-4-2-5. This team will only get home ice advantage for the first round, so success away from home will be vital to extending the season beyond the first round. * Depth – We’ve been talking all year about West Kelowna’s depth up front, and given some of the injuries they’ve faced this year it’s easy to see how essential that depth has been (see goal scoring above). However, there have also been some clutch additions to the defensive corps, giving this club 7 legit ‘top-4’ types. Depth in net, too? Check. * Special teams – It’s just huge in the playoffs, and something the Warriors haven’t actually done all that well this year. For much of the year, WK had the worst PP and PK in the league, eventually finishing at 19.3% on the PP (5th) and 77.7% on the PK (15th). More to the point, there were games earlier in the season that were lost due to special teams. However, things have been much improved in the past couple of months. In fact, in the final ten games the Warriors were 9/39 on the PP and 27/35 on the PK, which ain’t all that bad. Certainly though, it will require outstanding special teams to emerge from the Interior. And a series against Vernon? I’m betting there will be some powerplays on offer. * Overtime – OT is such a different animal in the playoffs it’s not really worth comparing to the regular season. For one thing, it’s 5-on-5 all night long, as opposed to 4-on-4 and then 3-on-3. 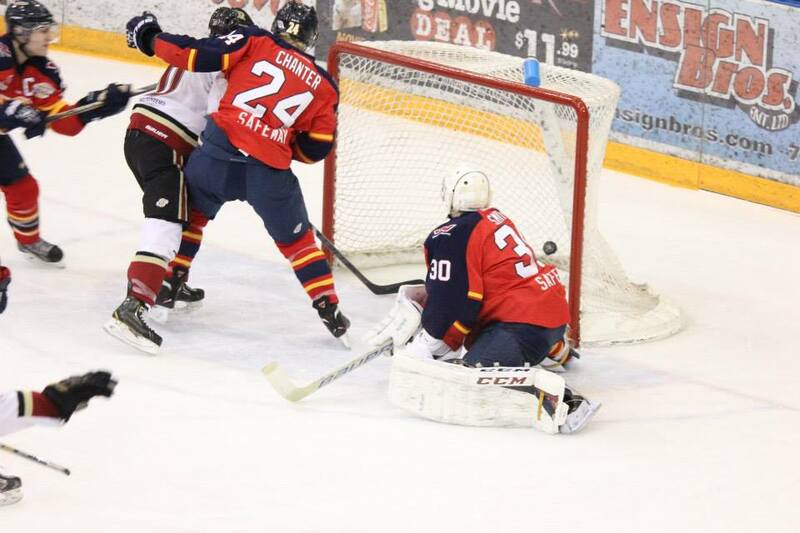 However, games and series are determined by golden goals, so West Kelowna will be hoping to improve on this year’s regular season record of 2-3-5. * Health – Well, yes. Health is huge in the playoffs. No question. A lot of that is luck, though West Kelowna will need to be aware of Vernon’s bruising style and try to avoid any unnecessary hostilities. As of now, I believe Jordan Masters (out since Feb 18th) and Taki Pantziris (out since Feb. 15th @ Vernon) are both day-to-day. Ryan Ivey is a little further away, and I’m not sure there even is a clear diagnosis as of yet (lower-body). But I’m hearing he could actually return at some point these playoffs, and maybe even in the first round. It was a little bittersweet to see West Kelowna win its final four games of the season only to lose the pennant to Penticton on a tie-breaker. And there are some people out there bemoaning what appears to be a much tougher first-round opponent as a result. That breaks down to four wins for the Vipers, two for the Warriors, and one tie. There were two OT games (both absolute thrillers in Vernon) and a combined scoreline of 25-20 Vipes. In fact, if you go back through the history books (check out www.vipersdiehardfan.blogspot.ca) this has been a hard-fought grudge match ever since West K. arrived on the scene, with not much to pick from between the two organizations. And of course, I find myself talking about home ice advantage in this matchup more than in any other. The Snakes stole a rare win at RLP on Feb. 1st, but neither team has had much success in each other’s barn. As the higher seed, that bodes well for the Tribe. The Vipers have been resurgent this year, and after missing the playoffs two years in a row Vernon is once again a serious contender. The Vipers jumped three spots in the standings this year, and earned 9 more wins (18 more points compared to 2012-13). It may seem obvious, but Vernon’s strength lies in its rugged defensive corps. If you don’t count Mike Statchuk (who has mostly been playing up front) Vernon’s blueliners average 6’2” and 200 pounds. A few weeks shy of his 19th birthday, Ken Citron is the youngest guy back there. They can all skate well and Coach Williamson tries to give all of them fairly even amounts of ice-time. Beyond special teams and goaltending, this series may well be won and lost on how well Vernon’s D-men handle West Kelowna’s tricky forwards, and whether or not they can do it within the rules. * It does look like Jared Wilson will miss games 1 and 2, after a 2-game ban for a blow-to-the-head major at the end of the year. 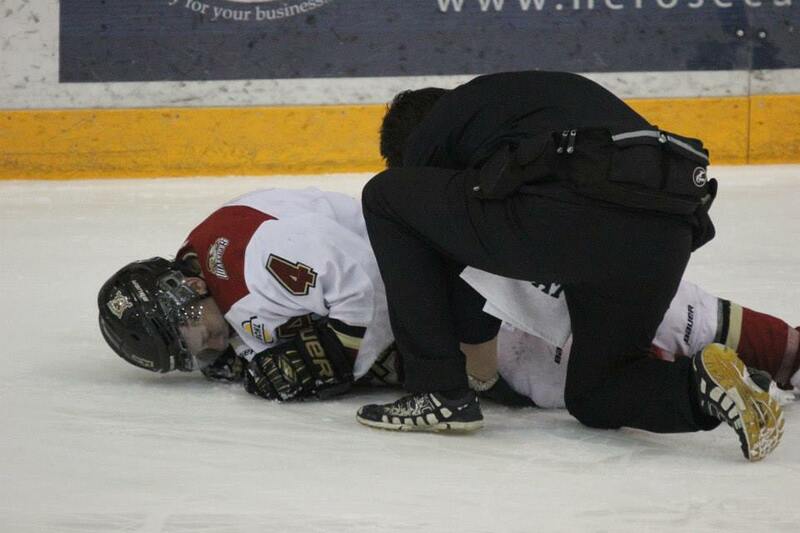 Austin Smith, meanwhile, was pulled (apparently due to illness) in favour of Danny Todosychuk on Saturday in Merritt. Does Vernon have a number one guy yet? Doesn’t look like it. It’ll be interesting to watch that pan out, as the Vipers try to figure out who can carry a team through the playoffs and who can steal single games heading into the RBC. It’s funny, but Vernon also struggled on special teams this year. At just 14.2 per cent, the Snakes finish with the worst PP in the league (just 11.1% on the road) combined with a respectable PK (81.5% = 9th). But again, it’s not as much about overall numbers as coming through when it counts, like when the Vernon penalty-killers absolutely stole the matchup on Feb. 15th. “We don’t want to get into a transition game. 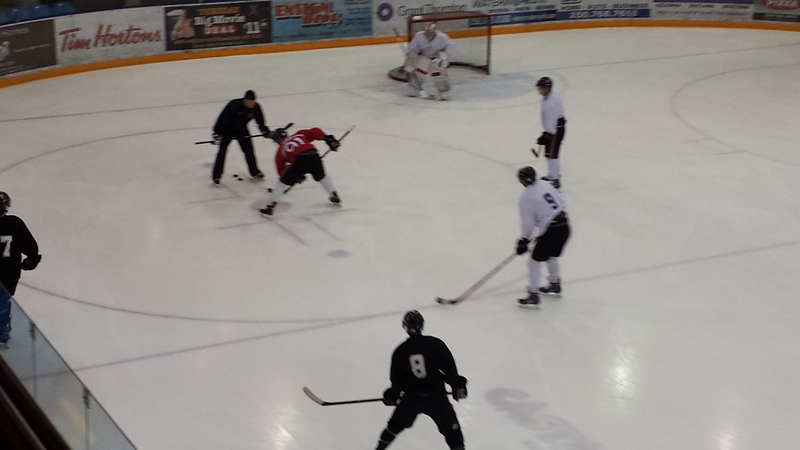 We want a cycle, grind-it-out type of hockey game” -Vipers Coach Jason Williamson (Feb. 1st at RLP). “We’re going to go out and play old-time hockey like Eddie Shore, Toe Blake, Gordie Howe” –The Hanson Brothers. The Warriors pounded Trail on Saturday, to wrap up the regular season in style. West Kelowna owned the puck and moved it beautifully against a Trail team showing good heart but a lack of both skill and numbers. The win gives West K. a four-game winning streak heading into the post-season, and a whole bunch of confidence as things get serious. A roaring start and strong game from Tyson Dallman. 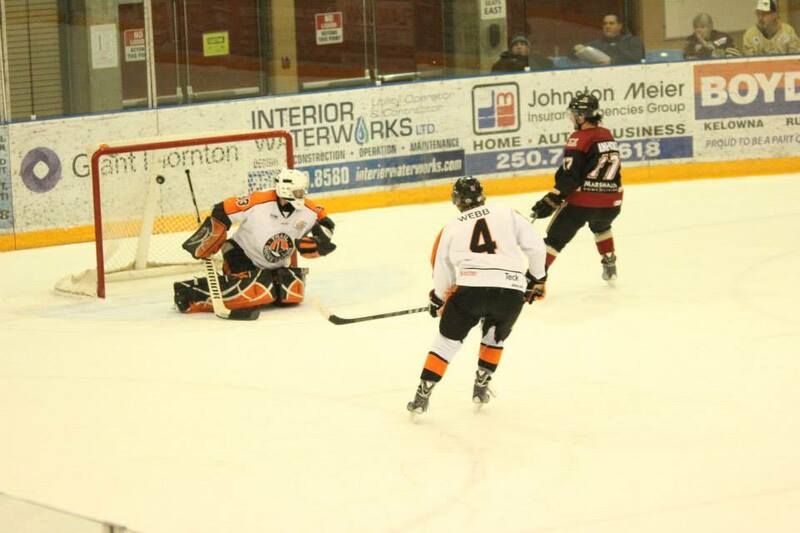 You had to sympathize with a Smoke Eaters club playing out the final weekend of their season without the type of manpower needed to handle West Kelowna’s high-powered offence, and the disparity was probably more apparent in this contest than any other this year. Playing his final game of junior, Kelowna native Dustin Nikkel did what he could but was hung out to dry all night. He stayed in there, and actually made some remarkable saves. Not the way he wanted his tenure to end, but I was impressed with how he (and his teammates) battled until the very end. 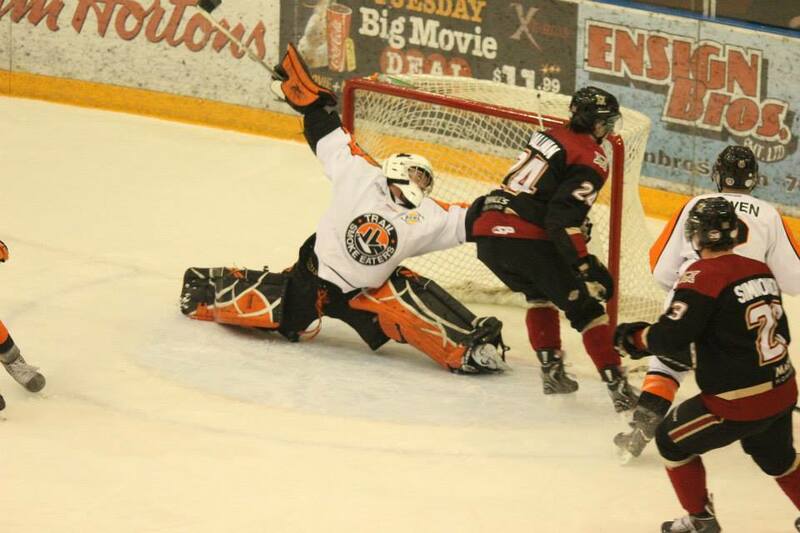 Tyson Dallman opened the scoring by walking around Nikkel after a Reid Simmonds feed on a WK 2-on-1 seven minutes in. Liam Blackburn tipped a Ben Tegtmeyer shot home to make it 2-0. A short-handed breakaway from Matt Anholt gave the Warrriors a third, with sweet assists to both Tegtmeyer and Dallman. Carl Hesler’s PPG late in the first gave the Warriors a 4-0 lead after 20 minutes and also ended up being the winner. After some more even hockey to start the second period, Kylar Hope reignited the offence when he followed up on a Seb Lloyd rush 11 minutes into the second. A nicely executed odd-man rush from the Smoke Eaters gave Jake Lucchini his first of the night, though a quick pair from David Pope (a bomb off a Hesler face-off win and then a tap-in from Blackburn on a broken play) officially meant the route was on. Jason Cotton then took a Seb Lloyd feed and roofed a backhander to give the hosts an 8-1 lead after 40. Trail did well in the third period, while the Warriors gave some more shifts to their fourth line (which played fiercely) and looked for some other options than the open shots. And the Smokies did salvage a little pride by potting a couple of late goals – Lucchini’s second of the game on a left-wing rush and a spinning shot from Nathan Browne that beat Cody Porter along the ice. The Warriors took the game 8-3 and outshot their guests 61-24 (at least). You don’t necessarily want to allow three goals in a game like that right before the playoffs start. But you can also excuse the Warriors for letting up a little in the third, knowing things were settled for everyone. While the Warriors took it from wire to wire, it was really interesting to watch the rink’s mood develop over the course of the evening. There was an awesome crowd on hand (nearly 1400) and the Hanson Brothers doing great stuff to add to the festive mood. However, as much energy as there was in the crowd, the life seemed to actually leak out of the building midway through the second period, just as West Kelowna was pulling away. Why? Well, despite a late equalizer from the Silverbacks, Brad McClure delivered the OT winner in Penticton giving the Vees a 3-2 triumph over Salmon Arm. The Vees had won the pennant, and West Kelowna’s romp was now irrelevant. It’s tough to see the standings end up with a first-place tie yet have the Warriors finish second on the tiebreaker of fewer wins. But there’s nothing unfair about it, and the way things go sometimes. No point dwelling on “if only’s” now. Whatever happened on Saturday and throughout season is now in the past. 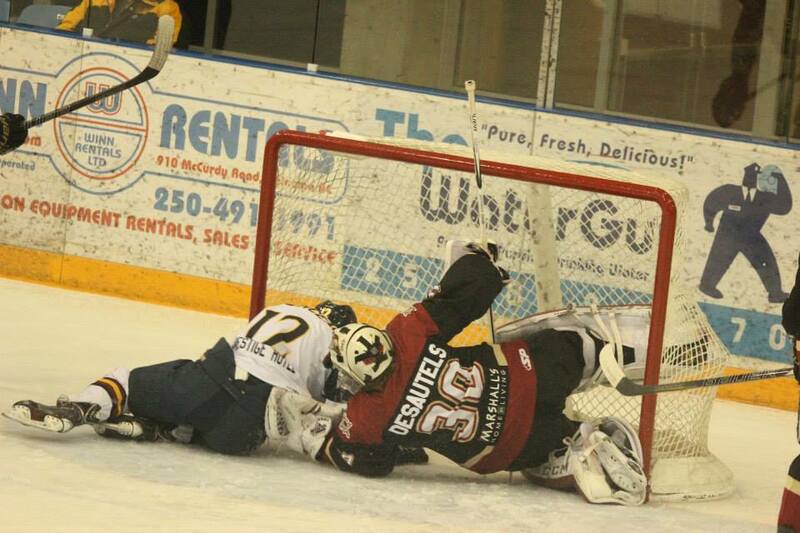 The 2014 playoffs begin THIS TUESDAY, with West Kelowna set to face Vernon in the first round. I’ll fire up a preview in the next day or two – but we do know that this will be one heck of a series. Fasten your seatbelts, folks. The season is done, and the real season is ready to begin.